Figure skater John Curry has won Britain's first Olympic gold in the sport. It is the country's first medal at the winter games for 12 years. Before tonight's winning performance, Britain's highest place in the men's figure skating had been fourth. Skating before a crowd of 10,000 in Innsbruck's Olympic Eisstadion, Curry took to the ice leading the field after the first two stages of the men's figure skating. His five minute performance was described by The Times as "masterly in its cool beauty of movement". He executed three immaculate triple jumps, but it was his artistic interpretation of the music that put his performance above those of his rivals. The nine judges gave him a forest of 5.9s for both technical merit and artistic impression. The Soviet judge was a bit tougher with 5.8 and 5.9 and the Canadian judge gave him two 5.8s. The 26-year-old from Birmingham was showered with carnations as he paused on the ice at the end of his performance to give his mother a wave across the stadium. Another British skater, Robin Cousins, finished 10th and Glyn Jones finished 16th. Curry shared the medal podium with Vladimir Kovalyov, of the Soviet Union, who took silver and Canadian Toller Cranston who secured the bronze. Afterwards he said: "I shall go to the world championships and then perhaps I shall retire from amateur skating. Perhaps I might form a theatre of amateur skating." He said he had enjoyed the Olympic competition more than he thought, "It's been very exciting - the perfect end to my amateur career and the perfect start to my professional career - I hope." Curry told a news conference two weeks ago he had had no intention of becoming a skater. Dancing was his first love but his father, a precision engineer, did not approve. Then at the age of seven, he saw one of the Wembley ice pantomimes on television and was immediately captivated by skating. He went on to win his first competition at the age of eight - and in 1967 he won the British Junior championship. He took 11th place in the Sapporo Olympics and since then has continuously held the British championship. For the past three years he has been training in the United States with the US women's champion, Dorothy Hamill, under coach Carlo Fassi. 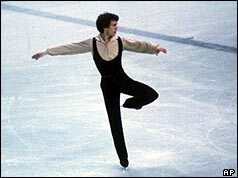 On 4 March 1976 John Curry won the World Championships - the first British man to do so for 37 years. Graham Sharp was the only other Briton to win since the event was first contested in 1896 - but Curry was the first man to take the European, Olympic and World medals in one season. He repeated his Olympic programme - but this time scoring one six for presentation, the other judges awarding 5.9. Once again it was the artistry of his performance which won him the gold medal. John Curry went on to create a company of ice dancers which put on shows like Symphony on Ice at the Albert Hall, the first time the venue had been used for an ice show. Prior to the world championships, John Curry was revealed to be gay by a German tabloid newspaper, Bild-Zeitung. He developed Aids and died in 1994.